We can talk about the interaction of East and West values on the Freemasonry in many different ways. Today, the globally social aspect is becoming more and more important. East and West coexistence, cooperation and understanding have become a question of life and death for all mankind. Freemasons needs to pay much more attention to this issue. If we look at it superficial, then we will truly find in the East very few Freemasons. However, if we look deeper at the more important matter, then the East holds great potential for the idea of Freemasonry. For that exact reason, today, we want to talk about the relationship between the East and West in a deeper aspect. It is the spiritual aspect. Our presentation will be about the experiences from the events organized from Supreme Council for Latvia. We would like to say how we understand the values of the Freemasonry. And we understand the modern challenges of the Freemasons connected to East and West spiritual traditions. The answer is, the programs of Via Integralis are the foundation interaction between East and West spiritual traditions. This is especially true between the traditions of Zen Buddhism and Christian Mysticism. What does Zentradition have to do with the Freemasonry?As our spiritual Teacher, Dr. Theol. Juris Rubenis said, if you only look at the superficial it would seem that several of the spiritual traditions are located far beyond the each of the others. But the deeper we go into any spiritual training the nearer we come to the common center. The central questions for all spiritual traditions, both Eastern and Western, is, “Who am I and what is my connection with the infinite universe?” Fremasonry, Christian Mysticism and Zen all have one more very important common question about the spiritual transformation . These are also themes of the Freemasonry. For that very reason, we regularly integrate the themes of the Freemasonry into the proposed basic program of the Via Intergralis. The basic theme of the last recollection was “The man’s initiation”. Initiation: what we know about? The initiation is a very fundamental instrument in the Freemasonry. The program’s leader and our teacher who himself is not a Freemason, is a doctor of theology. He thoroughly heads the ancient initiation ritual of Eastern and Western traditions. With this new background of information, we, in turn, performed the fourth grade Secrete Master’s initiation ritual studies. The results of the seminar had two revelations. 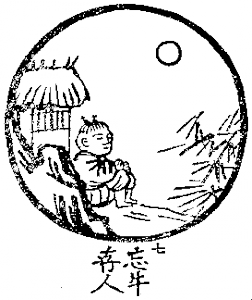 The first revelation: Our initiation rituals have deep roots in the initiation rituals of the ancient East. This was not surprising. However, this awareness of connection allows a deeper comprehension and sense of the nature of our own initiation ritual. The second revelation was more surprising. Our teacher announced, “The Freemasonry, in its present-day western traditions, is the only organization that has retained initiation rituals. Maybe this is a bit oversimplified declaration. However, this was told to us by both a serious initiation ritual specialist and opinion leader. Our first reaction was gratification. Our second reaction was the fear that we are too far from the fulfillment of the initiation ritual. Our third reaction was the resolution to study and fulfill the rituals much more seriously. When we talk about initiations, we must talk about two different types of initiations.The first is the initiation ritual which ends with definite results. You're admitted toFreemasonry. You are entitled to a certain degree.It is always a complete action. But itdoes not guarantee your spiritual transformation. The second is the initiation by essence. It is a transformation of human consciousness. We now see the Freemasonry as a continuous process of initiation. It has the same spiritual transformation and speaks about some of the alchemists. We studytheircontemplation retreats in this transformation. 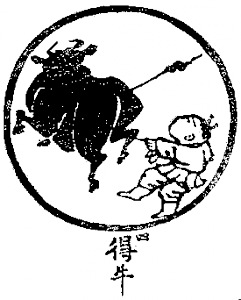 In the last retreat, we were studied the Zen Buddhist initiation representation.It is famously named "The Ox Herding Pictures ". 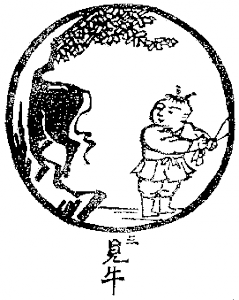 It was created in the tenth centuryin a series of black and white inkdrawings. 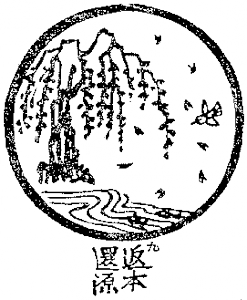 It depicts the human path toEnlightenment,or the initiation path. In the workingnotes we find striking similaritieswith Western models of initiation. Two examples are the legend"Holy Grail" or Dante's "Divine Comedy." We compared, in turn, “The Ox pictures” with the knowledge and experience of our Freemasons. 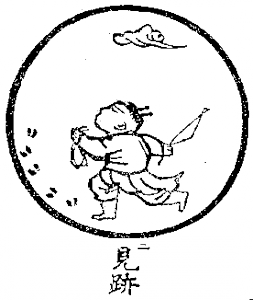 The original "The Ox Herding Pictures" arewithout of text comments.Eastern culture is an observation rather than an explanatory culture. Later,some thinkers added short philosophical texts to these drawings. 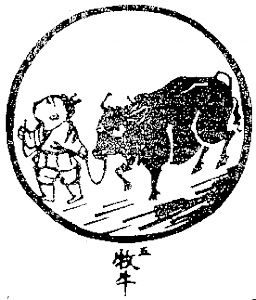 We will adda few brief comments, which is the essence ofthe great Zen masterKakhuan’s interpretations of the "The Ox Herding Pictures." 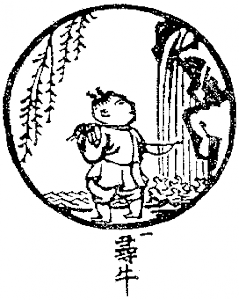 The young man is lostand alone in a dark forest. He does not know which way to go. He is looking the ox. He is searching for truth. However, there is confusion, darkness and fear. The young man notices the Ox. This succeedsbecause the young man’s search opens all of his senses. The oxhimself now leads the way and not the footprints. Itis Spring in the soul. This requires incredible effort.The Ox, with tremendous force, pulls in a dark channel and higher than theclouds. So far the young manhas felt enlightened.Now he can perceive only a little "I" futility. Domestication is a gradual process. When the young man calms hispassions, then the ox becomesserene.When the young man calms the perception of his own supremacy, he takesthe bull arms.. The young man sits quietlyin front of his simplehome. The Ox is no more. The Symbol fulfillsits role. All aroundis apparent simplicity. The young man looks to resign darkness and the dawn comes. 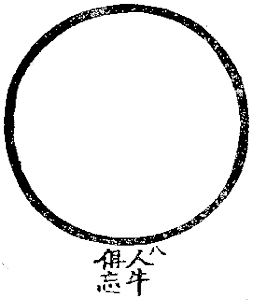 An empty ring. It is the sign of perfection.It has no beginning or end. It is freedom from concepts andprecepts. Form reappears. The truth does not withdrawal from the world. It has always beenhere. Reality, itself, is important to us without a mediator. The young man has become old and wise. He goes to the marketplace to share with others. In one hand hebears the whitepure staff of purpose. In the other hand he has the clean vessel with thewine of desires. Heshall hand them over to the young man. The wise man and the young man are not opposites.They are from one common reality. The old will die, the youth will live. Become acquainted with death! This is not the end, this is a transformation. Only the person who has experienced the same transformation can inspiretransformation in others. The shepherd of thefreeman returns to a world that does not understand what freedom means. ​This last pictureshows the synergy between the spiritual and the material. to One must be able to separate the spiritual fromthe material on the initiation path.However, we do not need to go away from the material world. The initiated with his spirituality comes back to the material world. We feel it'svery consistent with the Freemasons principals and targets. Up to the end of the Middle Ages, Western or, Christian mystic at its root is unites with Eastern spiritual traditions. Christian visionaries Thomas Aquinas, Augustine, and Meister Eckhart was strongly influent from the East. The Freemasonry borrows much from these men. Meister Echkart is the central figure. He is the most prominent representative of Christian mysticism. He has borrowed muchof the Eastern teachings. He has had a very significant effect on the Alchemist's andFreemasonry. It seems that in the course of history, the Freemasonry has also experienced external or exoteric phenomenon dispiriting dominance for internal, spiritual, or exoteric world’s feeling. But, the Freemasonry has learnt to save light in the prevailing darkness and associated wind gusts. This preserves respect for the internal world of man. From the first initiated freemason struggles with the most important task. Know yourself! Discover yourself! Improve yourself! The first carpet explanation is about the overall connection with the infinite universe. Eastern spiritual tradition influences are constantly found within the Scottish ritual. There is the special Eastern and Western knight’s degree, which is no longer either Eastern or Western values synergy of the highest level. The Freemasonry saves archaic initiation rituals through the centuries. Of course, freemasons are only a small handful of Westerns. Of course, one cannot declare that the biggest part of this handful is perfectly aware of that which is in the ritual. However there is also strong unconscious influence in the language of the symbols and signs. We may not set the question as if everything is right in the East and nothing in the West. Because in history and, especially, today we see many examples of the degeneration of Eastern traditions. The conversation is about integrated accessibility and synergy. Most substantial Turning point back to human internal world of cooperation with the Eastern spiritual tradition begin only the first half century In Western science and philosophy. At this point I must mention the names of theologians and scientists: Freud, Newman, Teilhard de Chardin, Heisenberg and Einstein. Why is he seen as the most freemason like thinkers of the most inspirational thinking of the freemasons? He had one central question: Who am I and what is my connection with the universe? He had all obsessed with the spiritual transformation ofmatter. Without this, Jung was grounded on substantial Western and Eastern spiritual value synergy. 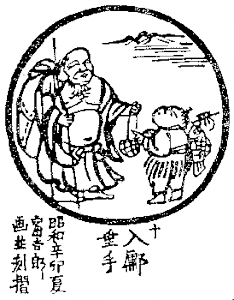 The relevance of our theme’s interconnection is Jung’s infatuation with the East. And once again, this is not only theoretical studies but these are in the foundations protracted journeys and observations. The contextual of our theme can be found in two of Jung’s teachings. One is collective unconsciousness, the other is archetype. In short, we will remember Jung’s teachings about the spiritual structure of man. The topmost is the unconscious level. Those are the things that we are well aware of. But this is only our natural visible portion and most insignificant portion. Our unconsciousness level is much more substantial. This determines the base of our human nature and behavior. Here we must separate the individual and collective unconscious. The individual unconscious forms developments that have happened to us but we are no longer aware of them. These are our early childhood impressions which we simply do not remember. These are also our unpleasant emotional experiences which we are forced to forget. But of those that have remained, despite those happenings, we have forced out of our consciousness. This has formed our nature and influenced on our behavior. But, the deepest and largest of our natural layers is the collective unconsciousness. The entire memory of the universe is hidden there. Here is also hidden the secrets of the freemasons. What is that? What is my connection with the infinite universe? Jung talks about methods with which we can only occasionally slightly crack open the door to the light for a short time. And with this we can activate our unconsciousness. Our unconsciousness is the key to our participation in the divine process of creation. In other words, our participation in the creative process by Great Architect. These methods are: dream translation, symbols, ritual and meditation. Symbols and ritual are essential to components to the Freemasonry. We merge that with meditation. At the moment, we do not practice dream interpretation. Many of these methods provoked skepticism and sneering. Jung said that the western material and rational person has become estranged from that world perceptive. And that is why he has to go through the prescribed confirmation of the Eastern spiritual traditions. This must be done to attain balance. We have to be aware of the East; however, we do not have to accept it as our spiritual world. This has a very vital importance, in which spiritual tradition you were born in. You can never run from this, just like you can never run from yourself. Understanding of God and religion are closely tied to archetypes. This is what Jung described in some of his patients which, in their neurosis, had tried to disown their own ancestral faith. The second most important thing which I wish to highlight in Jung’s teachings is that our unconscious is composed from our archetypes: inborn unconscious ideas and skills. The archetypes are universal, they are unify all of humanity. The archetype, for example, is belief in God. The male or femaleideal (Jung calledthe “anima” and “animus”) is also an archetype. Here we will return to male archetypes which our modern day authors, Moore and Gillete invoked: the warrior, the magician, the lover and the king. Jung endlessly searched for balance between the East and the West. At the same time he recognized himself as a Western person. We can say of both the East and the West: if you want to get to know yourself better, study Jung. The same could be said of the Freemasonry: if you want a better understanding of Freemasonry, study Carl Gustav Jung. We are returning to the previously mentioned recollected theme, “The Men’s Initiation”. In which we will again encounter Eastern and Western spiritual traditions and with modern-day Freemasonry challenges. Modern Western society has lost the men’s initiation tradition. There are playboys, there are macho men, and there is gender equality. The ancient initiation outlines are cast off as bigotry. But nothing has replaced them. Masculinity is lost. Can some quest be found for the freemasons? They are: King or Ruler, Warrior or Knight, Magician (Mystic) or Wiseman and Lover or … Lover. Theses qualities, more or less, were gifted to the ancient Eastern and Western historical and legendary spiritual leaders: Confucius, Buddha, Zarathustra, Moses, Plato, Jesus of Nazareth, Hermes Trismegistus and Muhammad. They inwardly merge more or less the king, the knight, the mystic, the lover and into masculine archetypes. 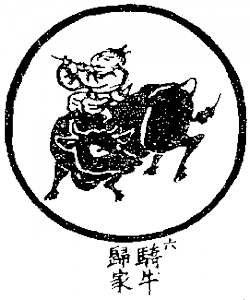 They represent the traditions of both the Eastern and the Western. The Scottish Rite comes to them as undivided spiritual inspirations. I concede that these labels in a modern Western thinking discourse might seem like laughable preconceptions. However, is there not room to talk about the fact that Western civilization has thoroughly distorted its notions about masculinity? The warrior is transformed into a cowardly tyrant. The mystic is thought of as out of his head. The lover is a sexually addicted pervert. The ruler is a megalomaniac with an inferiority complex. The Freemasonry is not running from these archaic languages and antique symbols. Freemasons must creatively search for equilibrium eternal, antique and modern, between Eastern and Western traditions. Freemasons also should not have to avoid the challenge of sincerely fulfill the male initiation duty. If we referred to Moore’s and Gillete’s modern teaching for the Freemasonry, then our duty is to perfect the initiation. We allow each to find himself and to perfect the four male archetypes: the Knight, the Wiseman, the Lover and the King. This means we must: First, cultivate the spiritual knight in each of us. Second, unite intellectually with the mystic. Third, harmonize love’s passion with the soul. Fourth, unite in ourselves all of these qualities. To be the King or the Ruler means to first be able to rule himself. This is art of royalty. Will we be successful? No. But we will strive to stay on this path. Das Unbekannte im Ritual. Loewendruck Bertram GmbH., 1990. Robert Moore, Douglass Gillette. King, Warrior, Magician, Lover: Rediscovering the Archetypes of Mature Masculinity. San Francisco: Harper Collins, 1990. William Johnston. Being in Love. The Practice of Christian Prayer. W. Johnston, 1988. Carl Gustav Jung. Memories, Dreams, Reflections. Vintage Books Edition. NY, 1989.